Gold medal: Volt 01 features polarized grey tinted lenses. The frame is finished in matte metallic charcoal with matte black rubber temples. Polished gold metal side inlays complete this winning look. 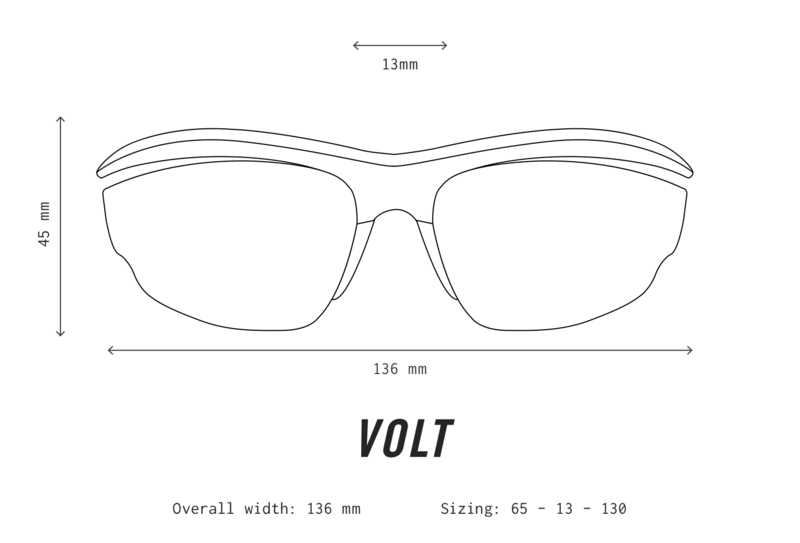 High voltage: Our lightest glasses ever, Volt frames are constructed of a super-durable proprietary high-tech polymer. Overall frame width is slightly narrower than many traditional sports glasses, offering a more aerodynamic fit for most, and a much-improved fit and appearance for those with petite faces. The lenses offer 100% UV protection and feature anti-scratch, anti-sweat (hydrophobic), fingerprint-resistant (oleophobic), and backside anti-reflective coatings, and are easily removable for cleaning or replacement. Nose pads are highly adjustable, and soft-touch flexible rubber temples ensure a comfortable fit. Design the VOLT to fit your style! No compromises: We set out to create the world’s first fully-functional sport/fashion sunglasses: all of the quality, craftsmanship, style and fashion-cred you would expect from Westward Leaning, and the best performance features available. All Westward Leaning SPORT sunglasses feature lightweight, sweat-proof construction and the best lenses on the market with anti-scratch, fingerprint-resistant, and backside anti-reflective coatings. A winner on or off the court: Our universally-flattering designs and highly adjustable temples and nose pads ensure the perfect fit on any face, guaranteeing they’ll stay put no matter how hard you play. Off the court? You’ll love their light weight and soft-touch nose pads and temples. We think they’re the most comfortable sunglasses you’ll ever own. Giving back: Proceeds from the sale of each Westward Leaning SPORT model benefit #LADIESFIRST, an initiative of Street Soccer USA. Street Soccer USA offers after school soccer programs for students across the country. All Westward Leaning sunglasses are designed to be flattering and comfortable on every face. All Westward Leaning SPORT frames feature highly-adjustable non-slip nose pads and temple tips, not only will they stay put during your next run, they will also be the most comfortable sunglasses you've ever owned. Learn more about how to adjust the fit of your glasses here.